Kitchen islands can be a godsend or a regret; if they’re placed and appointed well, they offer us invaluable workspace. If placed and outfitted poorly, we end up dancing around them to get to the important, useful parts of the kitchen, often bruising hips in the process! If you already have an island that you don’t love or are thinking about installing an island, we’ve got a collection of DIY kitchen island ideas to help you choose the best one for your use. 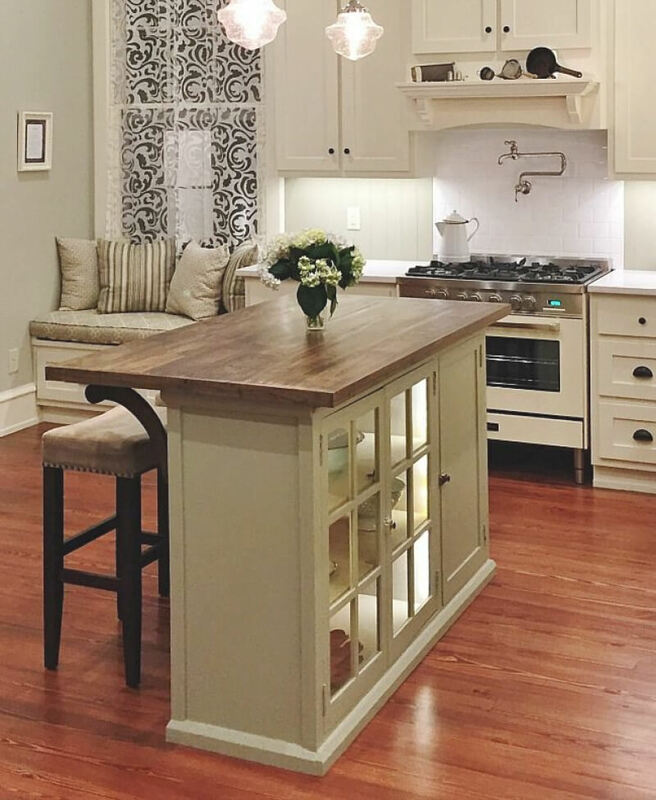 Kitchen islands aren’t just for expanding workspace anymore; they can double as a breakfast bar and increase your storage space as well; we even have some that will seat an entire dinner party when you’re finished preparing the meal! We’ve got DIY kitchen island ideas that show you how to make an island from scratch, transform your current island, and even use other household furniture in a new way to create a unique island. There’s something here for every taste and budget, but they’re all DIY-friendly. Have a look through our DIY kitchen island ideas to find inspiration for your next transformative kitchen project; the island is a perfect feature to transform the look and function of your kitchen. Have you ever wanted bar style seating that doubles as a table? This rustic, farmhouse style piece is contains a 46” x 44” surface which ends in an overhang. The spacious surface allows for simultaneous use of plates, tabletop top decorations and food preparation items. Additional kitchen storage space is provided by the cabinets in the base. If you go with this type of design, consider sticking to the two tone color combination to provide a nice visual contrast to your kitchen. Adding metal elements to classic wood pieces brings a touch of the modern to the vintage styling. The original cabinet was retrofitted to add the brushed aluminum top. The overhang allows for bar style seating. 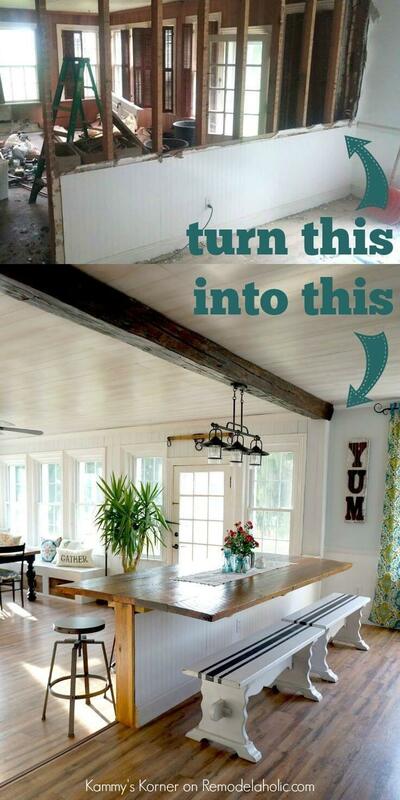 It is the perfect example of how creative you can be by combining parts from old furnishings. 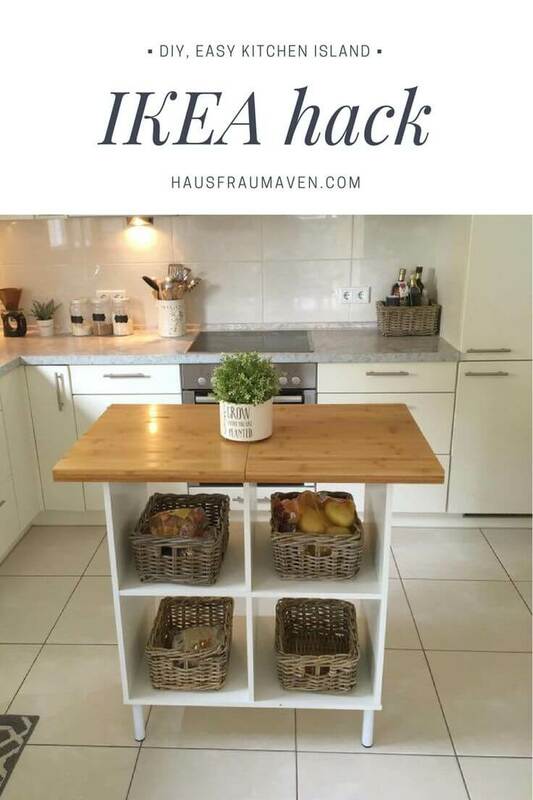 Thinking outside of the box when doing a DIY kitchen island can lead to some really unique designs. 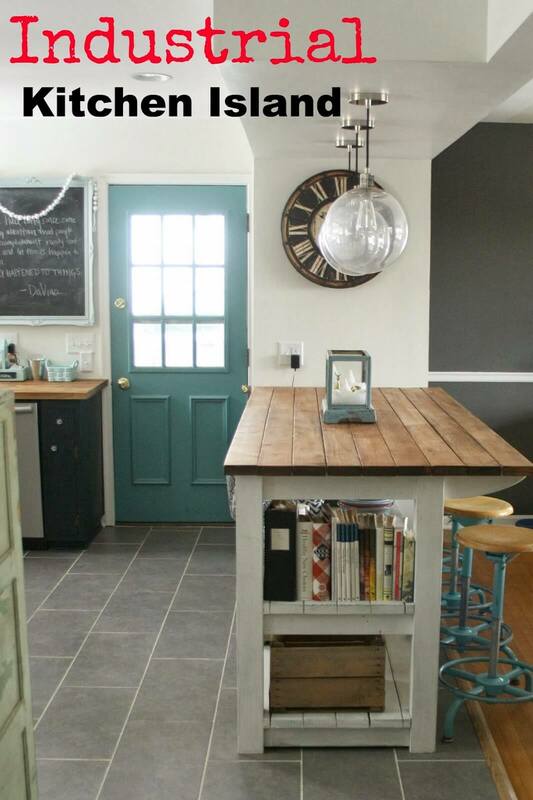 Take a look at this old door refashioned into a table. You would never think of a door in this way, but it totally makes sense! The long, heavy surface is perfect for a family-sized tabletop. Also, door engravings or designs offer a nice backdrop behind a tempered glass surface. This is a smaller size DIY island that won’t consume the entire kitchen. It is sturdy, yet graceful. It was created in harmony with the rest of the kitchen as the tabletop matches the same material as the surrounding counter tops. What makes this project distinct is the use of wood columns for legs and decorative molding around the edges. It gives the island an old world feel which is juxtaposed by the fresh, white paint. A trash bin is usually a foul-smelling, unsightly addition to the kitchen space. Yet, you can erase all the negatives associated with the trash can by hiding it in your DIY kitchen island. The enclosure also prevents smells from escaping into the kitchen air. Yet, throwing away the trash is still easy and convenient. You can even scrape scraps of food off the island surface directly into the trash. 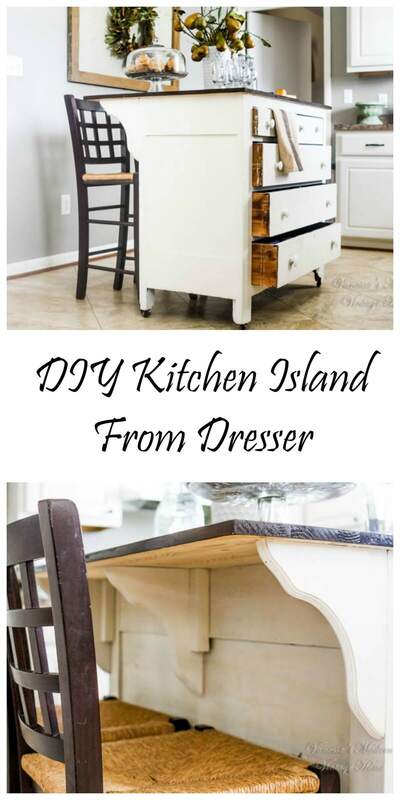 Following along the theme of re-purposing is this desk turned into a DIY kitchen island. With a few small alterations, including the addition of a bottom shelf, this study desk is instantly transformed into a kitchen centerpiece. When finding a new purpose for old furniture, your possibilities are practically endless. Experiment with different paint, textures and materials. 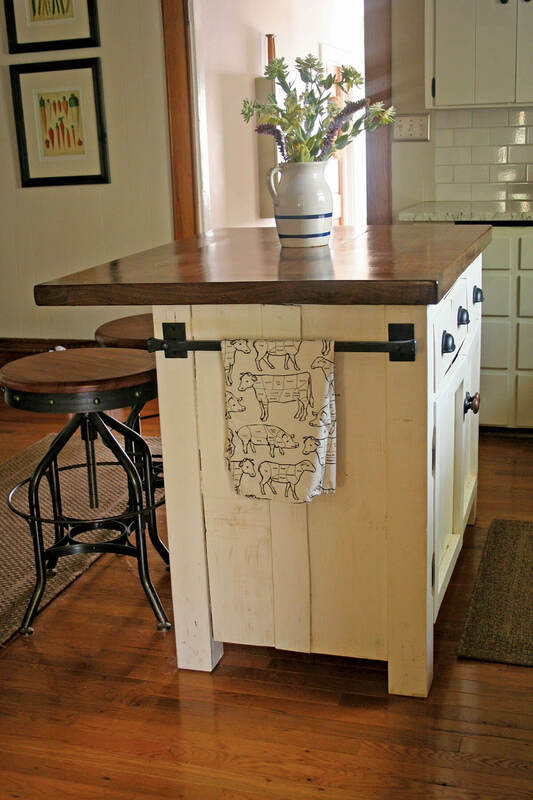 Your next DIY kitchen island might be as close by as your adjoining kitchen wall. An enclosed kitchen can be opened up to the rest of the home by knocking down part of the wall. The remaining structure can be used as a base for an island. Any type of wood or metal can be used to form the table surface. Some homes are already blessed with a kitchen island. However, this doesn’t mean you have to be satisfied with it. You can always make your DIY kitchen island better by expanding the surface area. Adding additional leaves to the surface allows for more seating and workspace area. 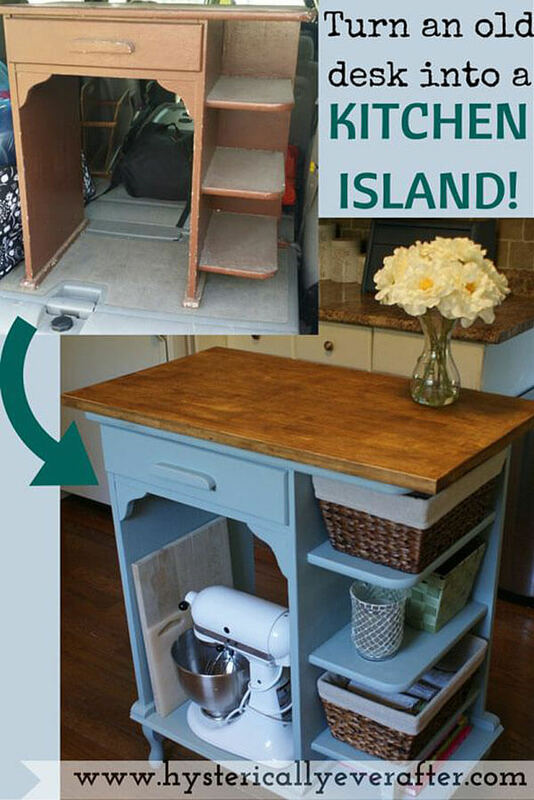 This DIY island opted for vintage legs and hardware for accent. The bright blue color makes it the dominant piece in an otherwise ordinary kitchen. An important goal of DIY kitchen island creation is saving space. This is best achieved by adding several storage compartments to the structure. Here, pull-out drawers make it easier to access storage space. The smaller profile of pull-outs looks cleaner, and doesn’t block passage ways in the kitchen like open cupboards. Everyone has an old bookshelf at home that is not getting much use. You can breathe new life into this furniture piece by moving it to the kitchen. Bookshelves are probably the easiest piece to convert to a DIY kitchen island. They are the right height, and come with built-in storage areas. In the example above, the backboard was removed to provide two-sided access to items. Plywood boards were added to the sides to present a tiling effect. The item was finished off in smooth, white paint in line with other kitchen items. Kitchen islands aren’t only for decoration or food prep. They should also be able to handle quick meals. This island uses the hang-over as a tabletop for hungry family members. By making the base an open air affair you can reserve space for dishes and other items. 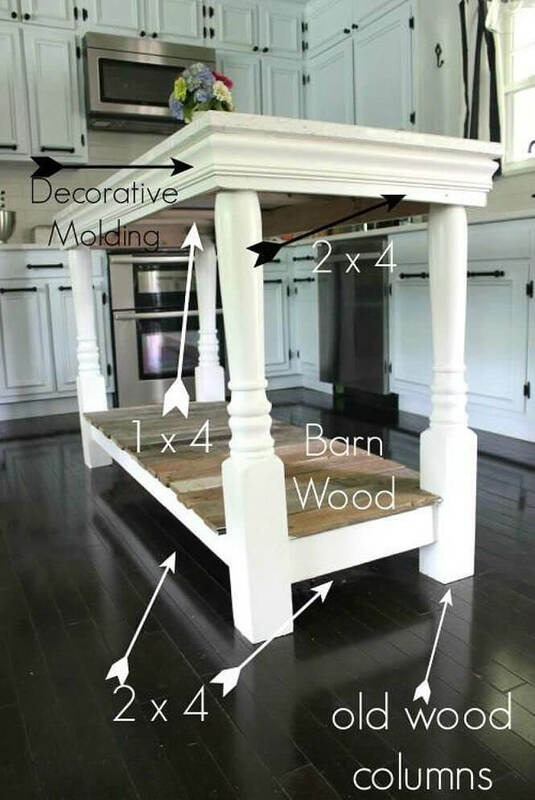 If you don’t want to rely on old furnishings to base your project on, you can always go the custom route. 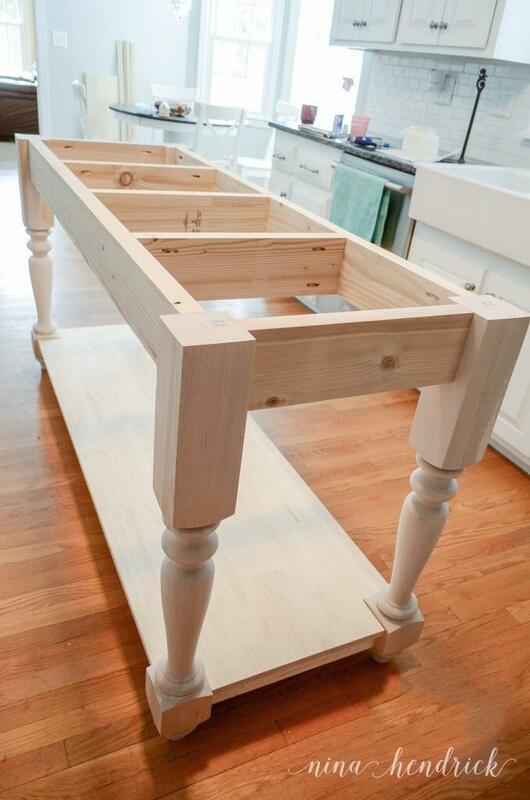 This allows you to create a perfectly sized DIY kitchen island for your needs. It also gives you the ultimate choice over materials and styling. The attractive design here uses two layers of railings for extra shelf space. Nothing inspires a rustic, old-country feeling like a worn washtub. Once you fit it with a tabletop, it becomes the perfect island for a country kitchen. The good thing about using a free-standing tub is that the legs and base are already done. All you need to do is pick out a complementary wood surface to finish off the top. 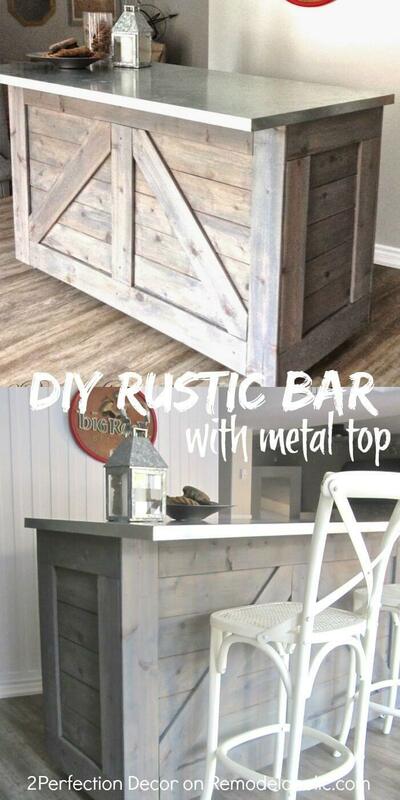 A rustic look doesn’t have to be simplistic. You can feel free up the ante to match the desired styling of your kitchen. This is best done by using marble slabs for the table, or some other type of rare wood. The island legs provide another opportunity for creativity. Look for unique designs that resemble classic pillars or Victorian designs. Don’t overlook the importance of handles, knobs and hinges when working on your DIY kitchen island. These are more than just pieces of metal. They are crucial accents that help define the island’s overall design. You can choose art deco styling for a modern look, or opt for antique look. 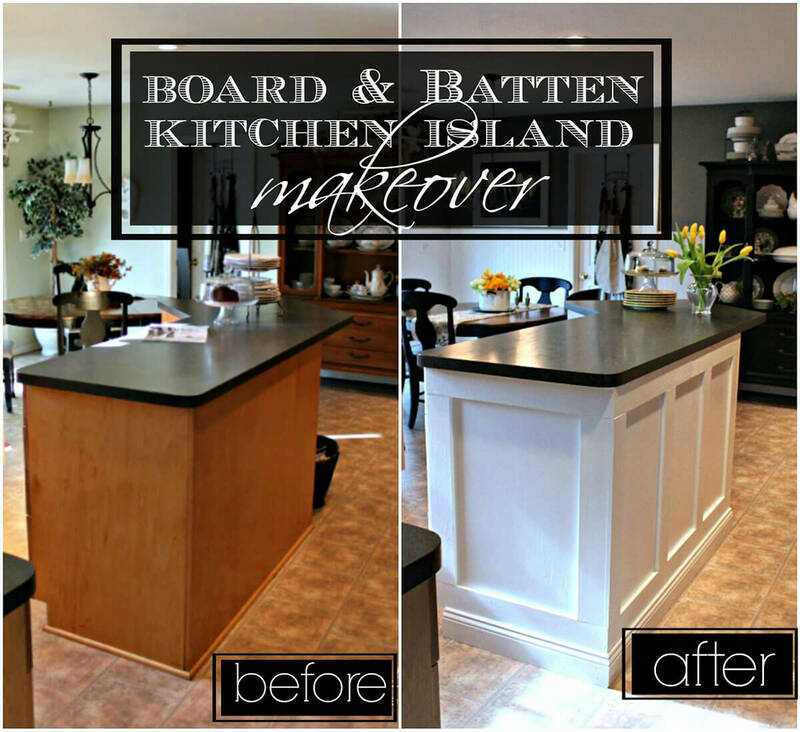 If you have an outdated island sitting in your kitchen, give it a new look with some fresh paint and trim. You don’t have to go through the work of changing the table surface just to get a new look. Make use of boarding to frame straight lines and add depth. Paint in a sharp, contrasting color to give your island its own identity in the room. Modified desks make great kitchen islands. Here, an old desk was given new life through painting and paneling. The thin, wood top was removed to add a more sturdier version. Perhaps the most interesting modification to this piece is the addition of wheels. Islands don’t have to be stationary. Mobile islands allow you to have ultimate control over the space in your kitchen. One good source of base materials for a new kitchen island is old furniture. Models from this furniture line are versatile and easy to work with. In this picture, the homeowner used a simple shelf, and transformed it into an island by adding a glossy, wood tabletop. Artisan-style baskets were added to give a traditional, handmade feel. This beautiful piece shows that you can produce a professional looking island on a budget. A used piece of garage sale furniture was painted a deep, grey color, and topped off with a poured concrete slab. Amber-gold hardware was added as the final touch to provdie some eye-catching glare. Dressers make great conversion pieces because they offer tons of drawer space. The main step in converting a dresser to a DIY kitchen island is to remove the top. Next, you can add wooden corbel brackets to create a hang-over. You also have the option of sticking with the original knobs to save money, or you can upgrade to fancier hardware for a more sophisticated look. There is no one right way to make an island. In essence, an island is just a small tabletop. Thus, it’s likely you can build one with materials you already have around your home. Take this one for example. It was constructed using basic wood cuts secured together by joints. Interestingly, the plain white surface was treated with a brown glaze to give some warmth and age to the appearance. When it comes to creating a DIY kitchen island a plethora of design options are possible. This converted kitchen cabinet uses table legs as corbels. It also showcases a beautiful pine countertop. The best part of this island is the addition of interior lighting inside the cabinets. This gives the piece a distinguished look, and makes it easier to find items stored inside.